If you deactivate the "Cooling with airdehumidification" function, the air inside the vehicle will not be cooled. The air inside the vehicle will also not be dehumidified. The windows can fog up more quickly. Therefore, only deactivate the "Cooling with airdehumidification" function briefly. The cooling with air dehumidification function is only available when the engine is running. 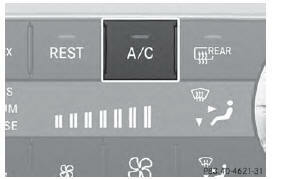 The air inside the vehicle is cooled and dehumidified according to the temperature selected. Condensation may drip from the underside of the vehicle when it is in cooling mode. This is normal and not a sign that there is a malfunction. ■ To activate: press the button. button goes out. The "Cooling with air dehumidification" function has a delayed switch-off feature.